Our Mission: To support lone soldiers before, during, and after their service. We are here for them, so they will no longer be alone. The Lone Soldier Center needs your help to provide Shabbat meals, furniture, supporting lone soldiers inside the army, at ceremonies and on Jewish holidays when they have no family to be with. Each year, thousands of young immigrants and volunteers arrive in Israel alone, to join the Israel Defence Forces and do their part protecting Israel and ensuring the future of the Jewish people. They are known as “lone soldiers”. These young men and women come from the United States, England, Canada, the former USSR, Argentina, Brazil, Germany and Australia. They are heroes and role models. The MLM "Center for Lone Soldiers" was founded by a group of lone soldiers in the spring of 2009, many close friends of Michael Levin, and all of us concerned with the difficult situations lone soldiers find themselves in during their time adjusting to life in Israel and serving in the IDF. 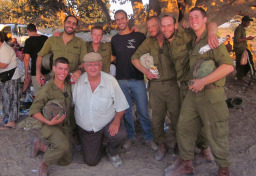 The programs we have developed provide much needed support and create a community of lone soldiers, by means of shared Shabbat meals, trips and social events to ensure that lone soldiers succeed in the army, and have a fair shot at creating a life for themselves in Israel following their release from the IDF.